The answer to the question ‘what is a cruiser bike’ lies in the naming and therefore self-evident. A beach cruiser bike is a specially type of bicycle that is particularly suited for riding or rather cruising on beaches and sandy shores, cycling across seafronts and oceanfront. Alternatively, cruiser bikes also come handy for cycling leisurely in neighborhood parks, city walkways, and in the suburbs. Cruiser bikes can be distinguished from other bike categories by their retro, drop down and curved handlebars, extra long, contoured, tubular frames, large seat, wide tires with broad rims, and efficient drivetrain. A cruiser bike evolved out of the need of a specific section of cyclists who wanted to have an ergonomically designed bicycle which they could use especially on coastal trails and terrains. Smooth riding-A cruiser bike usually comes with a rounded or tubular frame typified by a saddle base that arcs in a downwardly direction for linking with the tube frame going downhill. Every section of the framework excepting the head tube (the front part to which the fork is attached) and the seat base, is curved or rounded. Comfortable and steady positioning-Cruiser bikes sport handlebars that are backward curving and seats which are a tad inclined that enable riders to bend forward thereby helping them to cruise. 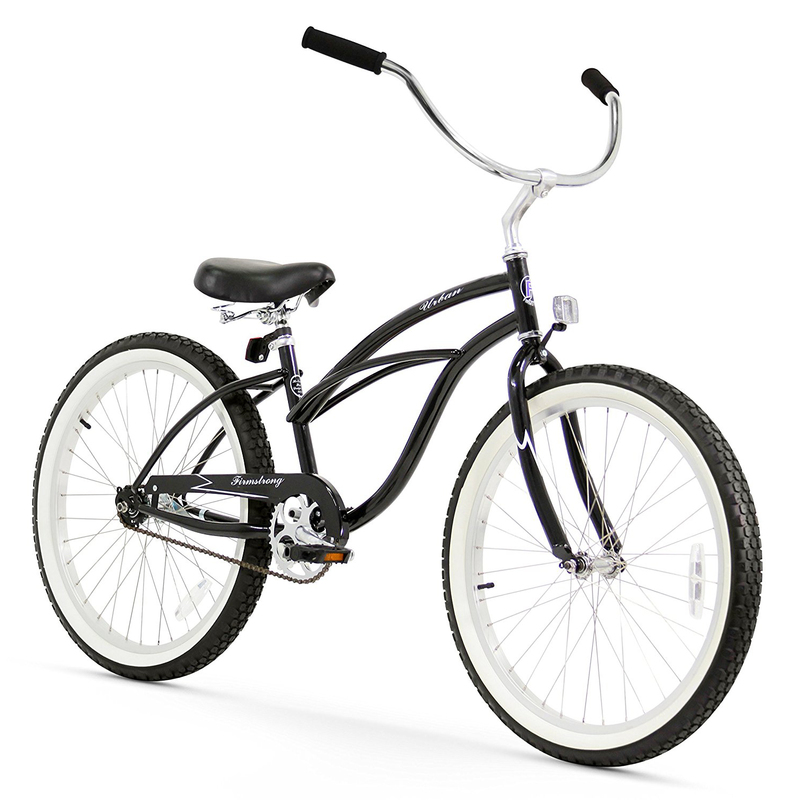 Easy to use-A cruiser bicycle generally has a single-speed gear, does not have suspension systems either at the front or back, and most models even do not have brakes. Unlike mountain bikes or hybrid bikes, cruiser bikes don’t have multispeed gear shifters which make pedaling them simple and convenient. Excellent grip-These bikes house rims and treaded tires that are a couple of inches wider than normal bicycle tires that facilitates gripping the terrain or track with firmness while the rider is cycling at high speeds. At the same time, the tires are made from soft materials that make them effective in absorbing shocks and impacts. Cannot be used on multiple terrains– Most of the Cruiser bikes come with a drivetrain that is equipped with a single-speed gear. So, shifting gears for the purpose of cruising or slowing is out of question when you’re riding a cruiser bicycle. Cruiser bikes are basically compartmentalized under two distinct categories-cruiser bike for men and cruiser bike for woman. Needless to say, the size and structure of a man’s beach cruiser bike is different from that of a woman’s. The cyclist’s BMI will determine the appropriate size of the cruiser bike that he’ll or she’ll be using. Talking about the structure of a cruise bicycle, the constituent components or parts are identical to those of other kinds of bike. So, a cruiser bike is built around a frame to which the fork, handlebars, saddle, wheel set, and the drivetrain are attached. Frame-The frame acts as the skeleton of the cruiser bike that supports the rest of the components. Depending upon the price of the model, the framework could be of steel, aluminum or carbon fiber. Bikes with frames shaped out of carbon fiber or a blend of carbon fiber and aluminum happen to be more expensive than those whose frames are made of steel or aluminum. Steel frames tend to be heavy and durable but prone to corrosion. Aluminum frames are lightweight, corrosion resistant, but surely less hardy than their steely counterparts. Carbon fiber frames are lightweight and rustproof but again are not as hardwearing as frames chipped out of steel. Forks-All cruiser bikes are fitted with a suspension fork at the front that is instrumental for dampening bumps and absorbing shocks during rides. The fork is carved out of steel, aluminum or carbon fiber. Wheels and rims-A beach cruiser bike houses wheels whose diameter ranges from 24”-26” and are fitted on rims made out of alloyed materials or aluminum. Brake mechanism-A cruiser bike generally uses a rim brake or drum brake mechanism on the rear wheel. Accessories-Depending on the price of the model, a cruiser bicycle comes outfitted with accoutrements like a bike basket, rear rack, fenders for wheels, reflector, chain guard, and kickstand for convenient parking. 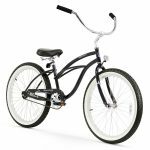 Bikers and cyclists will simply love to coast ahead on the Firmstrong Urban Man Beach Cruiser bicycle thanks to the bike’s 24-26 inch wheel set reinforced by a single-speed shifter that facilitates comfortable rides. The frame has been carved out of 13-1/2-inch steel tube and the wheel rims are of aluminum. The seat is extra large that hinges on dual springs which absorbs bumpiness and the ergonomically curved handlebar sporting rubberized grips makes for steady riding. Women will simply love to coast away on the EVRYJourney 26-inch 7-Speed Step-Through Touring Hybrid Bicycle. 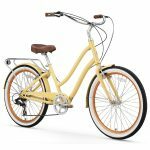 Designed around a heavy duty aluminum frame, this beach cruiser bike comes with a Shimano 7-speed shifter drivetrain and front/rear handbrakes that enable female urbanites to go on extended commutes as well as leisurely rides. The seat carved out of faux leather makes for comfortable saddling while the smooth tires minimizes tread and improves roll. 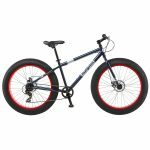 One look at the Mongoose Dolomite 26” Men’s Fat Tire beach cruiser bike and you’ll find it very hard to resist yourself from riding the stunningly glamorous bike. This bike features a steel MTB frame, knobby tires with marked tread patterns, mechanical disc brakes at the front and back, smooth pedals, 7-speed shifters, and rear Shimano derailleur. Additionally, the head tube is non-threaded that facilitates smooth handling and riding with steadiness. The 3-piece crankset in the drivetrain helps you to coast on sandy, rocky and of course paved terrains. 4. 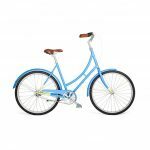 Brilliant Mayfair Three Speed Cruiser – Bright and Beautiful Colors! The Brilliant Mayfair Three Speed Cruiser has a low key profile and a minimalist appearance yet has a lasting impression on anybody who cares to take a look. It boasts of a handcrafted frame welded out of industrial grade steel. The Shimano Nexus 3-speed gears together with Shimano Revo shifters are instrumental for pedaling at a leisurely pace at the beachfront or cruising on city thoroughfares. The 26” tires grip the tracks firmly while the frame and suspension fork are compatible for mounting fenders and cargo racks. The Retroglide 7 Men’s Cruiser Bike from Raleigh has been especially designed for cruising on pavements, boardwalks, walkways, and in neighborhood lanes and parks. 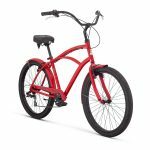 At the heart of this Raleigh beach cruiser bike is a hardwearing aluminum frame with ergonomically contoured tubes that enables the cyclist to take advantage of the effectiveness of the fork, handlebars, 26” tires, 7-speed derailleur system, and the fenders. The plus sized saddle makes for comfortable seating particularly on extended trips. Cruiser bikes as the naming clearly gives away are meant for cruising on beach trails and coastal tracks. Out of the 5 best cruise bikes compared and contrasted in this review, the products from Firmstrong, sixthreezero, Brilliant Bicycles, and Raleigh were found to more than satisfy the criterions for a cruiser bicycle. The model from Mongoose was the most affordable yet didn’t compromise on basic features.